Some children are tactile learners. These are the children that learn through movement of their hands. They NEED to move, fidget, tap, and wiggle those fingers and learning happens best when they are doing these movements. These kids focus on and recall information better when they are manipulating items in learning. 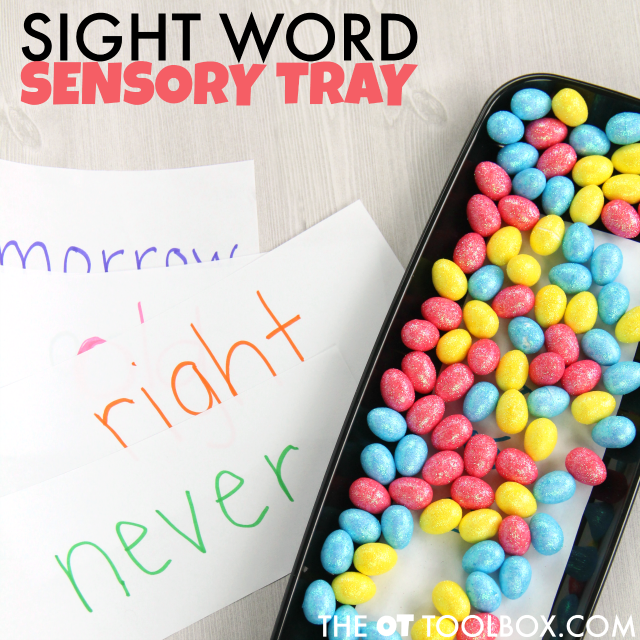 This sight word sensory tray is PERFECT for tactile learners. There is a reason--Sight words are just that-words that are learned by sight. They are words that have no "rule" and are learned just through plain old memory. But for the child who learns best through small motor actions, how are they supposed to learn those sight words just by looking at them and remembering them? 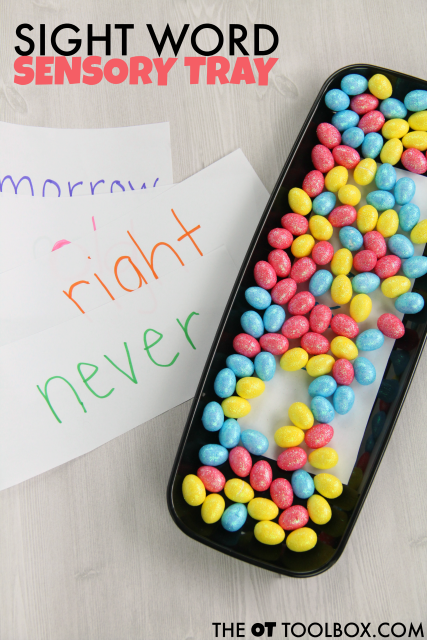 A sight word sensory tray is the way to go for tactile learners and kids that are just bored with sight word memorization! We've got a TON of sight word activities on the site that use tactile sensory play and movement if you are looking for more ways to help kinesthetic learners learn those sight words. First, write out the sight words on the half sheets of paper. Write one word per sheet and write with large letters. 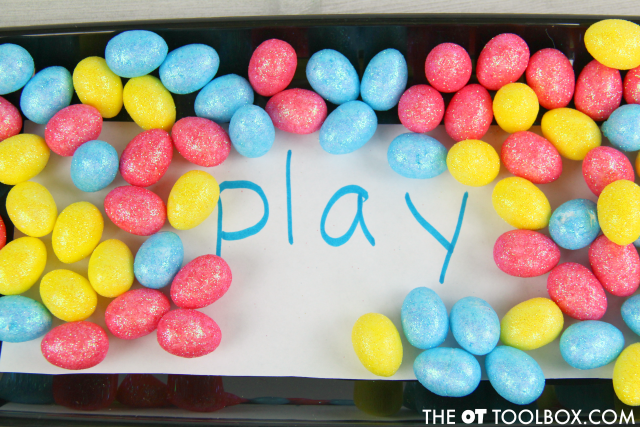 Place the sight word sheet in the tray and cover it with the foam eggs. Then, start moving those eggs! Kids can uncover just part of the eggs in the tray to reveal part of the sight word and then the whole word. They can identify the sight word by seeing part of the word or the whole thing. 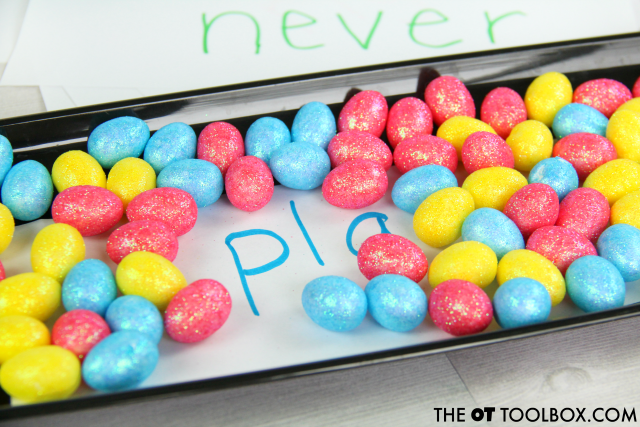 There are several other ways to use this sight word sensory tray to help tactile learners with that sight word list. Ask kids to trace the sight word by starting with one uncovered letter. Then, ask they to trace the remaining letters as they uncover each letter. Use a finger, the eraser end of a pencil, or a writing utensil. Try to guess the sight word by uncovering just one or a few of the beginning letters. Add a movement action for each letter as it's uncovered. One example would be to "form" the letter with outstretched hands and legs.